A long awaited conference combined together with a HEMA event. A project that brought together both martial arts practitioners and scholars around the study of a single fight book. Pietro del Monte was a famous condotierre of the late fifteenth and early sixteenth century. He left us, among other books, a real treasure for martial arts culture: the collected exercises (Collectanea), printed in Milan in 1509 after his death at the battle of Agnadelo. Besides several pioneer works, the Collectanea was surprisingly neglected by scholars’ and martial arts practitioners’ attention alike, mainly because of the difficulty in accessing the text. The situation changed significantly with the forthcoming digital edition at Bibliothèques Virtuelles Humanistes (-forthcoming- Vincent Deluz and Daniel Jaquet), the publication of two English translations (Jeffrey Forgeng and Mike Prendergast), the Italian translation (-forthcomming- Roberto Gotti, Giacomino Morandini, Jacopo Penso and Moreno Ricci) and the conference currently reviewed. Held at the Centre for Renaissance Studies and the European Institute for The History and Cultures of Food (University of Tours), the conference gathered specialists who shed more light into the art of combat as seen by Pietro del Monte, with academic lectures, object handling during a special exhibition, and with the practical interpretation of gestures in the gym. Prof Pascal Brioist (CESR, Tours) opened the day by outlining the military career of Pietro del Monte and by reviewing the historiography about the man. Notably, he showed early scholarly works predating the well-known works of Marie-Madeleine Fontaine and Sydney Anglo. Dr. Daniel Jaquet (Castle of Morges/CESR, Tours) explained the works and process behind the forthcoming edition, encoded with TEI, and the potential for further studies. Dr. Pierre-Henry Bas (University of Paris-Sorbonne) focused on the place of the horse and riding in the art of combat of Pietro del Monte. Jabob Deacon (University of Leeds) and Dr. Iason-Eleftherios Tzouriadis addressed the use of staff weapons in the Collectanea, with a comparative analysis of other fight books from this period. Dr. Jeffrey Forgeng (Worcester Museum, Boston) and Mike Prendergast discussed their respective approaches in translating the Collectanea. Dr. Manuel Valle Ortiz (Agea Editore) presented the Escorial manuscript of the Collectanea and shared his discovery of a later copy of the same manuscript. Roberto Gotti (Museum of Martial Arts, Botticino) brought objects related to Pietro del Monte’s art of combat for a special exhibition. He notably brought a commemorative coin with the effigy of the master and discovered a banner of his troops at the battle of Agnadelo. Alongside fight books of the period, both printed and in manuscript form, he displayed panels of a fifteenth century painted roof with fighting postures, a side-sword, and an arming belt. The day concluded with a fruitful discussion about the need for further research. Two speakers could not attend. Vincent Deluz (University of Geneva) sharing his work on the tradition of wrestling plays across martial sources, and Dr. Nicolas Baptiste (University of Chambery) addressing the “scientific” description of arms and armour by the master. Both papers will be included in the forthcoming proceedings of the conference (to appear in the journal Acta Periodica Duellatorum in 2019). 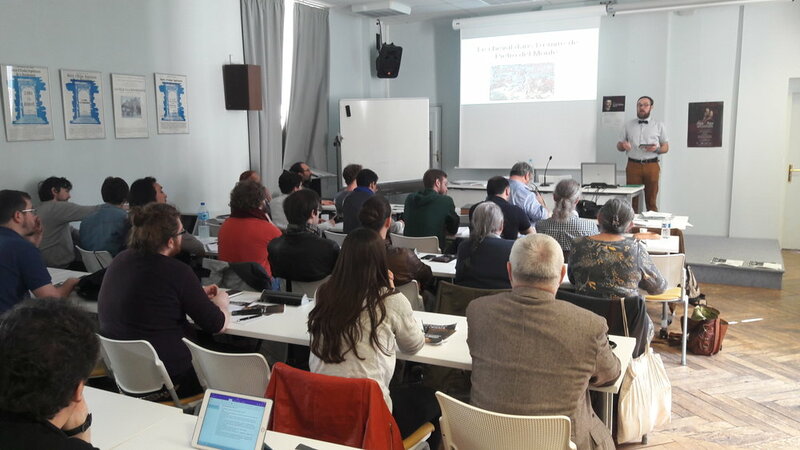 The second day of the conference took place in a gym’s hall, with the support of the HEMA group AMHE Touraine, and the order of workshops followed that of the teachings of Monte in the original text. An interpretation of selected wrestling plays was proposed by Dr. Daniel Jaquet (Gagschola, Geneva), as the underlying martial discipline for all weapons. The attendants had the opportunity to perform free-play based on the preferred ruleset of the master. Dr. Iason-Eleftherios Tzouriadis and Jacob Deacon (KDF, Leeds) tackled the use of the pollaxe, as the favourite weapon of Pietro del Monte. Roberto Gotti and Jacopo Penso (Guardia di Croce and Sala delle Armi) performed a demonstration of martial principles underlying the 52 lines of the second book of the Collectanea dedicated to the plays of the two-handed sword. Mike Prendergast (HCA, Dublin) concluded the day with the use of the single sword, showing how all these interpretation are connected. As the organiser, I believe that this event was successful in bringing together both worlds: the scholars and the martial arts practitioners. This is reflected by the mixed audience, from both groups, that attended both days. Hopefully, under the umbrella of the Society for Historical European Martial Arts Studies, we will organise more events of the same format, for the shared benefits of all parties interested.